There were two important things in the original Advanced Dungeons and Dragons modules back in the day that are missing in the 5e book. Barovia responds to evil acts, it encourages it, nurtures it. When a PC performs an evil act willingly, on the DMs judgment, this could cause a dark powers check. It was an opportunity for Barovia’s malignant energies to suffuse their power into the PC. The PC had a chance to resist this influence. If he failed he could be granted an evil feature or punishment. Overtime, as PCs continued committing evil acts, they would slowly turn into dark beings. Which is in a way what happened to Strahd Von Zarovich. I have no opinion really about this option, I believe there are supplements out there to replicate this effect, but my real recommendation is to use the next Dark Gifts. The Dark Gifts were so popular that they were brought back by Adventurer’s League admins on public demand. They way they work is that anytime a character of level 5 or lower dies in Barovia. You can ask them if they would rather die, or continue living. If they choose to continue, they are brought back by the Dark Powers. It says it happens in a moment but I advice to change the time frame to whatever works more for the story. Maybe it’s a few hours later or next morning. The PC who comes back to life this way is transformed randomly. Most of the time they get an evil or monstrous feature such as: burnt eyes, broken/deformed spine, long fangs and so on. Coming back in these circumstances alone is enough to erupt a party fight as trust among PCs can easily be broken in Barovia. This is exactly the aim of the setting. On a related note, it is not clear whether Strahd Von Zarovich causes this or even knows about it or not. 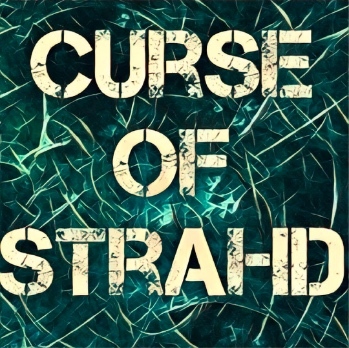 You can handle it however you want, maybe Strahd knows about this phenomena but has no control over it. Or just maybe, he can control it and is reviving party members only for fun. That’s ok too. I strongly recommend using the Dark Gifts because if you do, then you can afford to be extremely rough on the party in the earlier levels. Crush them ! Barovia is supposed to be deadly and the realm of dread. Don’t fear to crush them, players will have to opportunity to come back to life with a few set backs and continue the adventure. They will even want to do it despite the disadvantages just to have a chance to defeat Strahd with THAT character. The most important feature of the valley for the PCs is that it is surrounded by a thick fog that never recedes. It is toxic in nature and no one can cross it and get out of Barovia (except the Vistani). 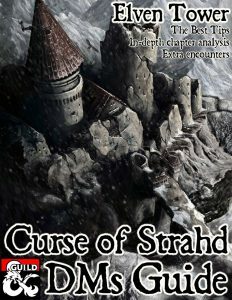 Not even Strahd can get out, that is his curse. On a related note, there is only one confirmed character to have ever escaped Barovia. It was Vecna, in a time before he became a god. This is old D&D history and is not mentioned in the module. Vampires are traditionally vulnerable to sun light, however the sun in Barovia is always partially obscured fog and clouds. It doesn’t count as sun light for overcoming vampires resistances. It says on page 24 that vampires tend to stay indoors during the day though. But PCs will be so surprised when vampires attack them openly during the day. Which will probably happen in Vallaki in the Coffin Maker’s Shop (page 116). A nice touch is the information on alterations to magic on page 24. What it really means is that magic is transformed into whatever you want that is a creepier version of itself. Those are just suggestions. Barovians are some somber folk. Just take a look at Barovian characters art throughout the book and you’ll see. After centuries under the reign of Count Strahd you would not expect any less. But there is a fact that few know, every time a person dies in Barovia, the soul has no way to escape the realm. After a time the soul is cycled again and a new boy or girl is born with that soul. This means that all the original Barovians in the realm from 384 years ago (when Strahd became a vampire and Barovia became a closed demiplane) are still there. They have been born again each several times during that time frame. The same is true for every visitor that has entered the Valley of Barovia. Adventurers who have tried to defeat Strahd unsuccessfully have been born time and again as common folk. However all these souls do not account for the present population of Barovia. A high percentage of Barovians do not have souls. They are projections of Strahd’s consciousness. There is no feasible way to know for sure who has a soul or not, only Strahd knows instantly who is soulless. Count Strahd only feeds on people with soul, he draws no nourishment from soulless shells. It can be safely assumed that most of the “main characters” in the different Barovian locations have souls. But it is never confirmed and you can treat this as you like. They look like Spanish gypsies, all of them have souls, they are the only ones who can exit Barovia as they please (reason explained in page 27). It’s important to know they are divided in two factions; the ones loyal to Strahd, and the ones loyal to Madam Eva. Target is unable to cast spells with somatic components. Vulnerability to a damage type. Attunement to a magical item is broken until curse ends. Blindness, deafness or BOTH ! It says that the curse ends only under the effects of Remove Curse or Greater Restoration. If the Vistana dies the curse doesn’t end. That’s really aggressive against low level parties. The spells needed to stop the curse are high level and scrolls are difficult to come by. Also the only people in Barovia who could perform these spells are Madam Eva, Rudolf Van Richten and the Abbot. But these curses are just suggestions. Apparently Vistani curses are really powerful. Researching Rudolf Van Richten’s past (page 238 and his diary), we find that he is in fact subject to a Vistani curse placed on him a long time ago after he killed a bunch of Vistani who kidnapped his son Erasmus. The curse is that a dark fate awaits anyone befriended by him. That’s why he works alone. Because of this curse his son and his wife died. And to protect Ezmeralda he abandoned her. So the advice here is: if a Vistani is wronged and a curse is used, It has to be something foul that portrays the powerful gypsy powers in Vistani blood. Page 29 introduces two encounter tables for day and night encounters. The encounters are really good, there are combat encounters and others that are just creepy, to convey how fucked up Barovia is. My advice with “random encounters” is always the same. Roll them before the game as part of your prepping, or don’t even roll, choose from the table the ones that will work best for your game or players. While these options are good, there aren’t enough for a full campaign, you’ll run out of options soon enough. Here are some more options. This is one of the most important encounters in the book. After PCs enter Barovia this is how they find Kolyan Indirovich’s letter (or real letter if you used the letter hook). Also they are attacked by a savage pack of Strahd controlled wolves who will probably cause the party to run for their lives to the Village of Barovia. This should have been a chapter. This is the place where the PCs will encounter Madam Eva. There’s a Vistani who will tell them a tale of the mighty wizard who stood up against Strahd about a year ago (that’s actually Mordenkainen). And of course the official card reading for the artifact’s locations. You will have to go back to the first chapter to reference the section about the reading. In this encounter a guy named Bluto is fishing using seven year old girl as bait. The girl’s name is Arabelle and if she’s returned to her father in the Vistani Camp near Vallaki the party will befriend the “evil Vistani”. A demented wizard has been sighted near Lake Zarovich. This is no one less than Mordenkainen himself! Unfortunately he is in a state of madness. The party will have to seize him and then cure him. Any knowledgeable players in your game are going to flip out when he reveals his identity. He could be the secret ally against Strahd. If he isn’t then there is no clear development for this, except that he leaves the party in search of his staff and spell book. By the way, a Remove Curse or Greater Restoration spell is needed to help him, if the party does not have access to these spells, Rictavio is in possession of a Greater Restoration spell scroll, other than him, the party might choose to ask The Abbot for help. It is implied that this is a younger version of Mordenkainen though.